Selhurst Park has a present capacity of 26,309 and is an excellent example of a traditional English football stadium. It was also the home of the first ever ground sharing scheme when Charlton Athletic moved in temporarily in 1985 whilst the Valley was redeveloped. The stadium itself has a real football feel to it. The atmosphere is regularly very good and the noise created by home fans on cup games is rarely beaten at this level. Given the choice, sit behind either goal for the best views and to avoid structural pillars. 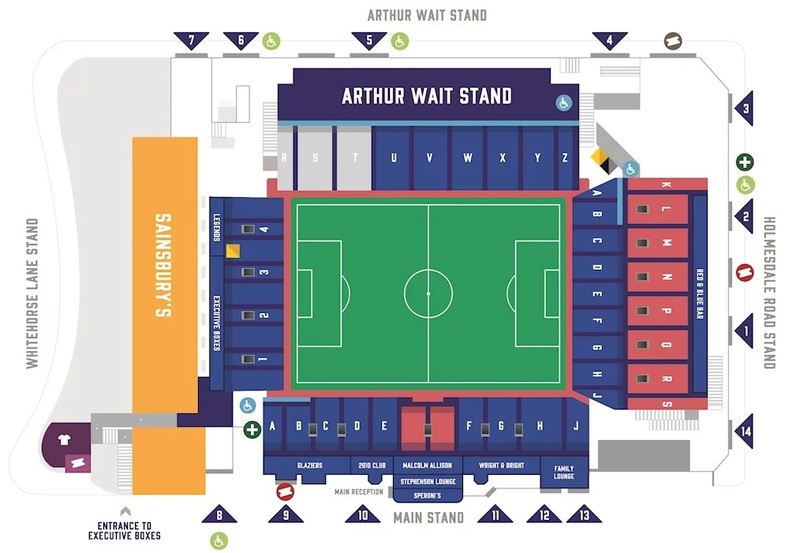 Visiting supporters are now situated in one side of the Arthur Wait Stand at the end closest to the Whitehorse Lane End. Over 2,000 away supporters can be accommodated here but there are many bad seats that need to be avoided if possible. Seats toward the rear of the stand are wooden with little leg room and hindered views from an over hanging roof and a supporting pillar. If you're lucky enough to visit when it's unreserved seating, my advice is to arrive early. Jamie Green tells me that the Clifton Arms on Clifton Road is now a home supporter only pub. This is the nearest pub to the ground. Away fans are best off heading towards Flora Sands which is a Wetherspoons pub, opposite Thornton Heath railway station. Alternatively, the Prince George is a small family run Pub that welcomes home and away fans. There is plenty of street parking in the local area, but a lot of it has been converted to residents only on match days or pay and display with a four hour limit. Make sure you allow yourself some extra time to make the journey as it's a very busy area especially on Saturdays. The nearest / closest train stations to Crystal Palace's Selhurst Park Stadium are Selhurst, Thornton Heath and Norwood Junction. Selhurst and Thornton Heath stations are served by London Victoria main line, Clapham Junction, London Bridge (every 30 minutes) and East Croydon (every 15 minutes). You can also use Norwood Junction station which is served by London Bridge, East Croydon, Gatwick airport and a limited service from London Victoria. Click on the following link to see a map of Selhurst with directions from all three stations Map of Selhurst Park. PLEASE NOTE that Crystal Palace overground station is NOT the station for Selhurst Park. Travel: Being a Chelsea fan who has relocated to the South Coast me and my friend Zak got a train from Portsmouth to Thornton Heath, we walked from the station to the ground in about 30 minutes but this included a quick stop and eat at Subway. Quick and Easy walk from the station just follow the road round till you get to a Whitehorse Lane. Go down here which is about a 5 minute walk till you reach the Sainsbury'’s. The ground will be on your right. Refreshments: We stopped at Subway on the way to the ground which was surprisingly empty considering a major match was happening some hour after we ate there. Quick service and good all round taste. Impressions: As always for a new ground I had a walk around the perimeter of the stadia. The ground is truly a classic including the very old Leitch main stand which was brimming with history. When we went through the turnstiles (Which to my amazement were still manual i.e no barcode scanner an actual human ripping the ticket! )we went into the partial open concourse. It seemed very cramp but made for a good atmosphere. The toilets however I do recommend you to take caution as you need to go down a small flight of stairs which does get slippy with alcohol etc. Facilities: On entering the stadium We went to the toilet straight away after a train journey of over 2 hours. The toilets seemed a bit small to cater for over 2,000 supporters however it did somehow. You need to go down a small set of stairs so do take caution as they do get slippy with alcohol etc. There was only 1 catering facility as well so the queues were growing rapidly and got longer every minute. At half time one would presume the scramble would be living hell! Considering it's an oldish ground I was expecting leg room to be very cramped however it was fine apart from the pillars and TV Gantry that can so easily impede your view. Another warning is although we were only chanting in the concourse before the game their were stewards filming us like we were barbaric monsters! And As us Chelsea do, we started filming him with our camera's singing "You film us and we'll film you". Exit: On exiting the Stadium the stewards were quick and effective after the majority of our support stayed and cheered the Blues and especially the stand out player John Obi Mikel. Once again I used the toilet before another ordeal of using the train back. Enjoy: A very enjoyable trip and a great three points and all round performance from Chelsea. Only our 2nd win away from home in the league this season! I would highly recommend a trip here for others and I do hope Selhurst sticks around for as long as possible before the doom of another Identikit stadia arrives to take over. Travel: Palace's access issues are bordering on infamous. Lets put it this way. A mate of mine got the coach to the game. Had to be up at 5.30 to get there in time, and was still on the M25 2 hours after the game ended. On top of that, kick off was delayed! I got the train, which wasn't so bad getting there, as there is a direct train from Watford Junction every hour. Heading back I decided that rather than wait an hour for that one back, I would go via Victoria and Euston. …Oh my this is a mistake.… Anything that involves a change at Victoria, especially at 6pm on a Saturday night is bad. Impressions: The away fans get a raw deal here! On the surface, the ground looks very good and very balanced. The small Whitehorse Lane Stand with the boxes above, the older Main Stand and Arthur Wait Stand down the sides, and then the big two tiered Holmesdale End, with its unusual almost old fashioned curved roof. The away section though…oh dear. Im not even moaning about the wooden seats, I sit on one at Goodison and that doesn't bother me! The stand is horrifically shallow though, I spent most of the game stood on my seat a good foot higher than the people in front of me and I still couldn't see the near side of the pitch! Absolutely no room to move either, so difficult to move about, in the end people were just standing where they felt like. The stairway at the end of the stand, supposedly a sterile area, just had half the crowd stood there by the second half! Oh, and to top off everything, the roof leaks! Atmosphere: Expected big things given Palace's reputation, and was disappointed first half. It improved though once Palace realised they weren't going to get smashed, and was very good from about the half hour onwards. The away ends only advantage I suppose is that its got great acoustics, as it was great when we bothered. Anything Else: The awful layout of the away end also meant it was near impossible for the stewards to police us. People standing anywhere they wanted, climbing on seats and up poles, and seemingly everyone in the away end constantly had a bottle of beer in their hand! Enjoy: Logistics really spoil all the good Palace have. A good location and great atmosphere are really tempered by horrific access and the away end! 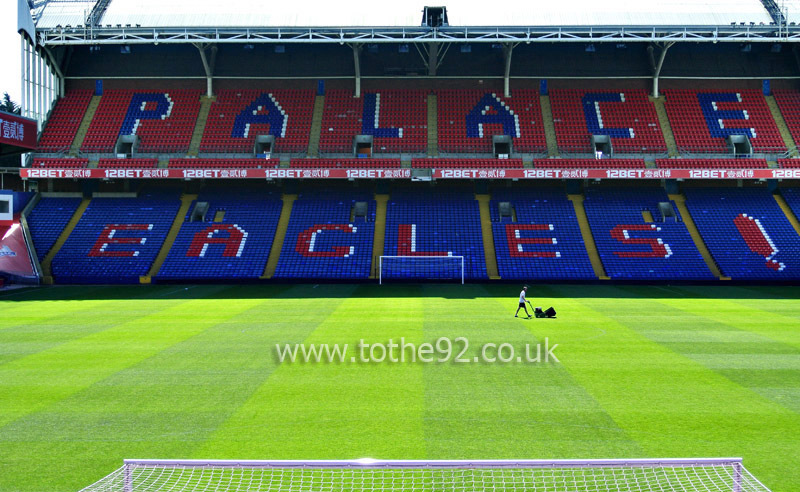 Have you been to Crystal Palace's Selhurst Park? To tell us about your experiences and to feature on the site, simply complete the fans review form below!